Between November 2017 and March 2018, the Department of Education (ED) held two negotiated rulemaking efforts to address (1) setting standards for determining whether programs prepared students for “gainful employment,” and (2) governing loan forgiveness when students have been misled or defrauded by an institution—also known as borrower defense to repayment. Both were do-overs for Obama administration rules that largely focus on concerns with proprietary colleges (but have an impact on all institution types). Not surprisingly, given the nature of the topics, both rulemaking efforts ended without the negotiators reaching consensus. Because the borrower defense to repayment rules finalized in 2016 made changes to ED’s financial responsibility standards, the department agreed to convene a dedicated subcommittee comprised of accounting experts to take on the broader task of updating the rules to conform with new accounting standards for nonprofit institutions and for leases. In the end, there was general agreement from the main committee on the work of the subcommittee; and there is a good chance that ED will move forward with most, if not all, of that language. Under the formal negotiated rulemaking process, if all voting members of the committee agree to draft regulatory language, ED is committed to using it in the next step in the regulatory process, which is a notice of proposed rulemaking (NPRM) for public comment. Without consensus, ED is free to propose rules as it sees fit; however, in areas where there was general agreement at the negotiating table, the department will often stick with that language. Throughout the borrower defense to repayment negotiations contentious topics surfaced between representatives for students and borrowers and for-profit institutions. When negotiations concluded in February, agreements had not been reached on issues such as how much time a former student would have to submit a claim for loan forgiveness, the standard of proof necessary to show cause for forgiveness, and how the amount of forgiveness would be calculated. The 2016 rules added to the financial responsibility standards a number of triggers, which would have required institutions to provide additional surety to ED for possible loan forgiveness claims. The automatic triggers and most of the discretionary triggers were dropped from the drafts under discussion. Those that remained related directly to liabilities stemming from approved borrower defense claims or impacted only for-profit institutions. The quantified results of these triggers would result in a recalculation of financial responsibility scores. 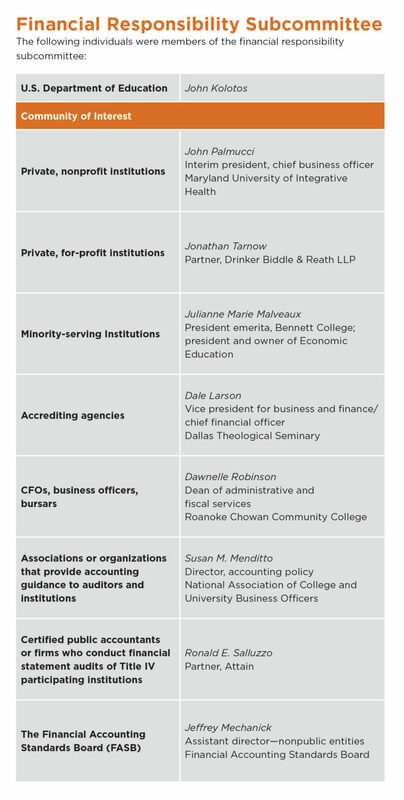 Convening separately, the subcommittee (see sidebar, “Financial Responsibility Subcommittee”) concentrated on changes to definitions and calculations of composite scores found in 34 CFR 668 Subpart L, Appendix A (for for-profit institutions) and Appendix B (for nonprofit institutions). 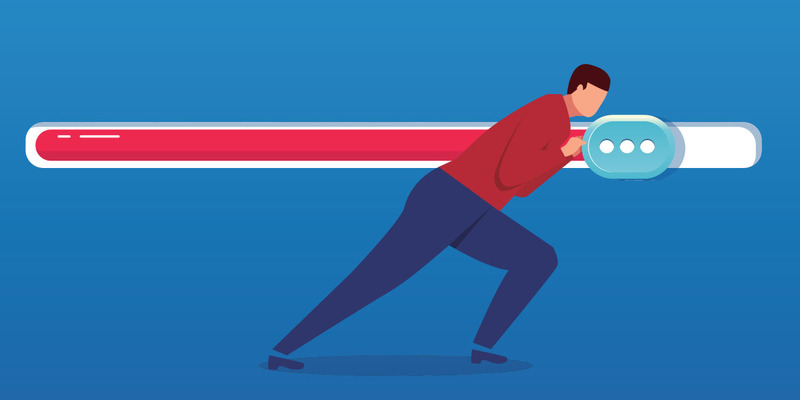 The changes are needed to conform ED’s methodology to recent changes to accounting standards mandated by the Financial Accounting Standards Board (FASB) and to clarify some long-standing points of confusion in ED’s calculation of scores. A required supplemental schedule in the audited financial statements that must accompany eZ-Audit submissions. The schedule augments information, not required by generally accepted accounting principles, needed to calculate composite score ratios—and would contain all elements required in the calculations. The gainful employment rules promulgated by the Obama administration applied debt-to-income and loan repayment rate measures to all programs offered by for-profit institutions and to nondegree programs offered by public and nonprofit institutions. Under the Higher Education Act, these types of programs are eligible for Title IV student aid, because they prepare students for “gainful employment in a recognized occupation.” Programs that failed to meet designated thresholds in two out of any three consecutive award years would lose eligibility for federal aid. For-profit schools had railed against these rules since their inception, often arguing that if such standards were imposed on their programs, they should be imposed across the board. ED, under the Trump administration, seems to have come around to this way of thinking as well. In March, by the beginning of the third and final week of negotiating committee meetings, draft language provided by ED called for subjecting all undergraduate educational programs to a debt-to-earnings calculation regardless of institution type. Programs that failed that measure would have a second chance to show their value through a loan repayment rate calculation. Importantly, the only penalty for failure would be a disclosure requirement to warn current and potential students that the program might leave them with debt that they would be unable to repay. Feeling hampered by a lack of data to enable modeling of various ways that these measures might be calculated and what the impact might be—coupled with deep philosophical differences among various stakeholders—the committee failed to find middle ground on most issues. ED representatives indicated that, absent consensus, the department was likely to propose rules similar to the drafts provided at the start of the last session. Under master calendar provisions for Title IV of the Higher Education Act, ED must issue final rules no later than November 1, for the rules to become effective at the start of the next award year on July 1. ED first must publish proposed rules, leaving time to solicit and review public comments, before drafting the final regulations. NACUBO expects ED to issue notices of proposed rulemaking in both these areas sometime between late April and June. Association representatives suggested to ED that the changes to the financial responsibility standards could be issued separately on an expedited timeline, since they are less controversial and could presumably move more quickly. This would provide timely guidance to institutions that plan early adoption of the new FASB standards. We have no indication at this time whether ED will decide to do so. NACUBO CONTACTS Anne Gross (retired), vice president, regulatory affairs. Bryan Dickson, senior policy analyst, 202.861.2505; and Sue Menditto, director, accounting policy, 202.861.2542, also contributed to this report. ED representatives indicated that, absent consensus, the department was likely to propose rules similar to the drafts provided at the start of the last session. NACUBO appreciates the efforts of volunteers who give their time and expertise to represent the interests of business officers at negotiated rulemaking. Kelli Hudson Perry, assistant vice president for finance and controller, Rensselaer Polytechnic Institute, Troy, N.Y; and Dawnelle Robinson, previously at Shaw University and now dean of administrative and fiscal services, Roanoke Chowan Community College, Ahoskie, N.C., represented the interests of CFOs and business officers on the main borrower defense to repayment committee. Robert (Danny) Flanigan Jr., vice president for business and financial affairs at Spelman College, Atlanta, also served on the committee representing minority-serving institutions.